This weeks Monday Minutes breaks away from the EMS quick tips and focuses on three ECG recognition tips that will keep you on track and alert you to abnormalities when looking at those ECG tracings. Some may think these are basic tips. But you must master the basics, the normal before you can recognize the abnormal. Take a look and you will see what I mean. Be sure and share this video if you think it will help others. Here is the info on the guide mentioned in the video. 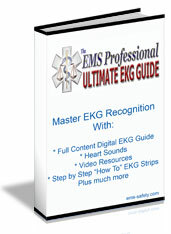 Some of the ECG information we learn and take in as EMS providers are nice to know. Meaning it doesn’t always change how we treat a patient. After all we have to treat the patient and not the monitor right? The J wave or Osborne wave while not a treatable abnormality, can let us in on what may be going on with a patient, giving us a bigger picture to work with. Have you ever seen a J wave? Shout it out in the comments below and share this on FaceBook.